what's cooking in my tuscan kitchen: As my friend Linda Kay says... "everything is better with bacon!" just what the title says! I'll be keeping you posted on what is cooking on my stove in Lucca, Italy! As my friend Linda Kay says... "everything is better with bacon!" 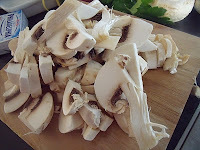 This week at the supermarket I got a great buy on huge, beautiful mushrooms! But you had to buy 1 and a half kilos which is roughly 3lbs! Tuesday night I made sausage and mushrooms... and today? ! When I looked in the fridge to see what other ingredients I had, I found fresh tagliolini, light cream cheese and bacon. As my friend Linda Kay says... "everything is better with bacon!" so here are the recipes I came up with! 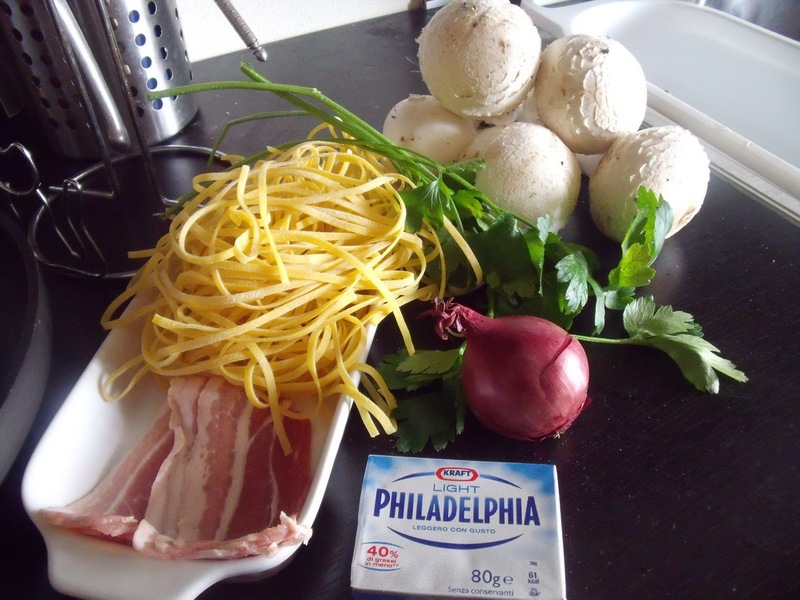 Stuffed mushrooms - an appetizer and Pasta with mushrooms, onions and bacon. 5 very large mushrooms or about 12 small ones. First, put a large pot of water on to boil for the pasta. Next, wash the mushrooms and clean by slicing off the bottoms of the stems. 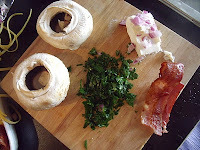 Then, remove the stems from 2 of the mushrooms, set caps aside for stuffed mushrroms. 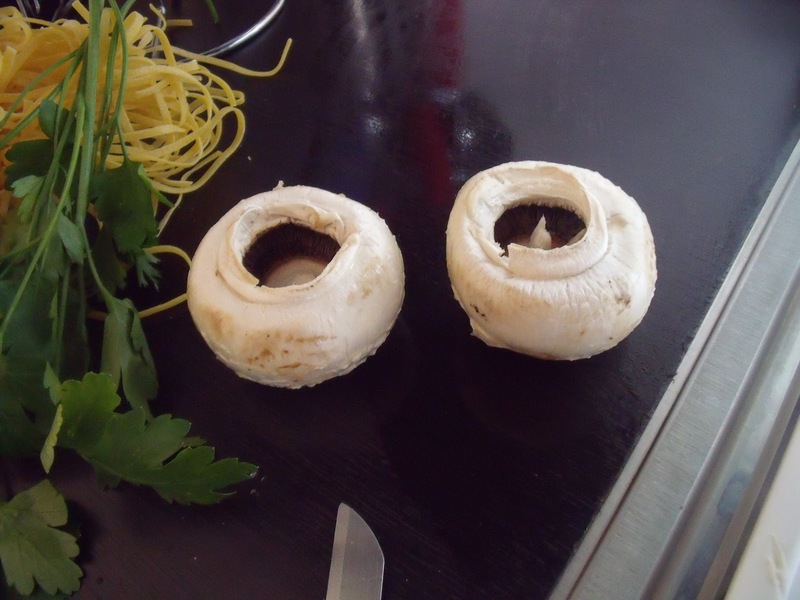 Quarter the remaining mushrooms and then slice, including the stems removed from the first 2 mushrooms. 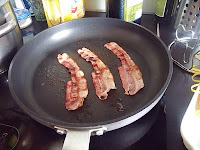 Now, fry 3 slices of bacon until just crisp, remove from pan. Pour off excess bacon fat. Chop the onion. Set aside about 1 heaping tablespoon of the chopped onion for the stuffed mushrooms. 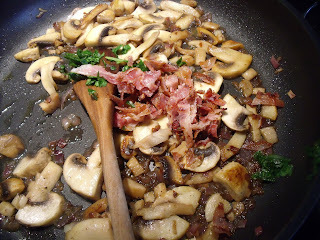 Put the sliced mushrooms and chopped onion in the pan you cooked the bacon in. Add a couple of tablespoons of extra virgin olive oil and start to sauté over medium heat. While the mushrooms and onions are cooking, make the filling for the mushroom caps. 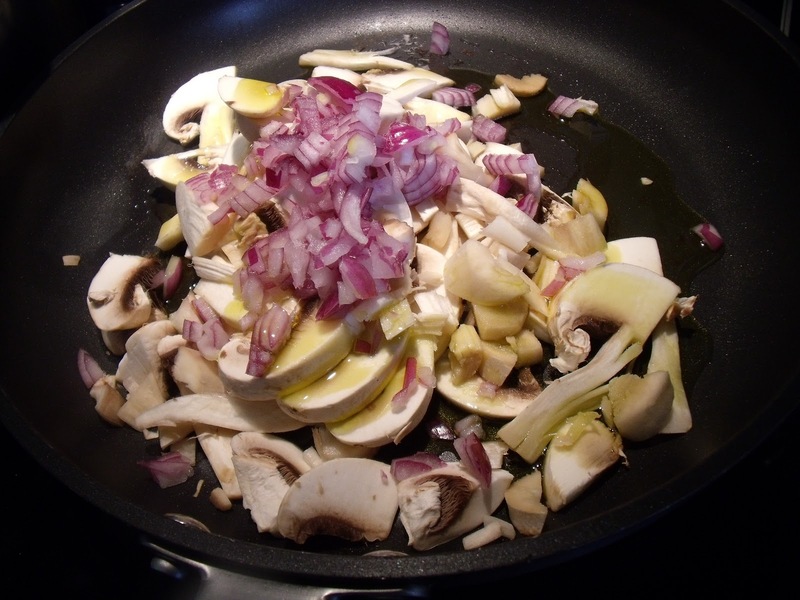 Don't forget to stir the mushrooms and onions every so often! Finely chop the parsley. Set aside about 2/3 of it for the pasta sauce. Crumble 1 slice of the fried bacon. 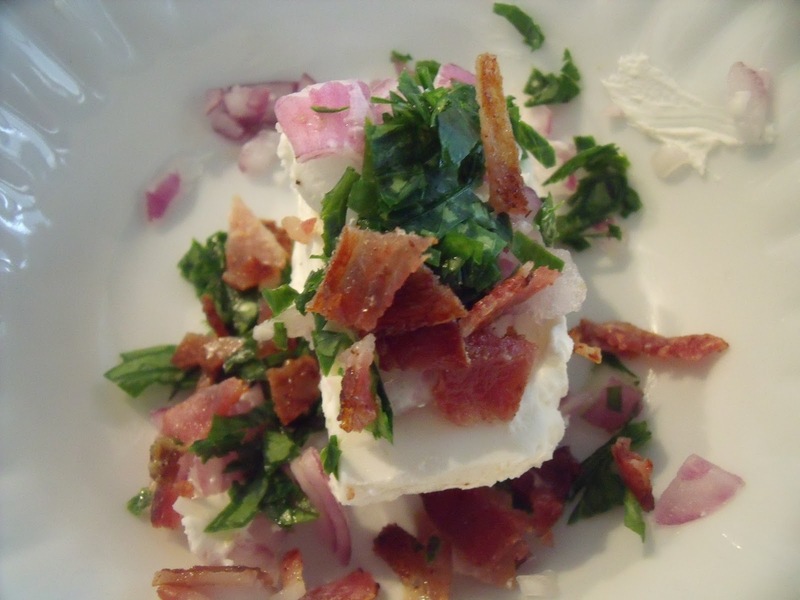 Put the cream cheese, onion, parsley and bacon in a small bowl. 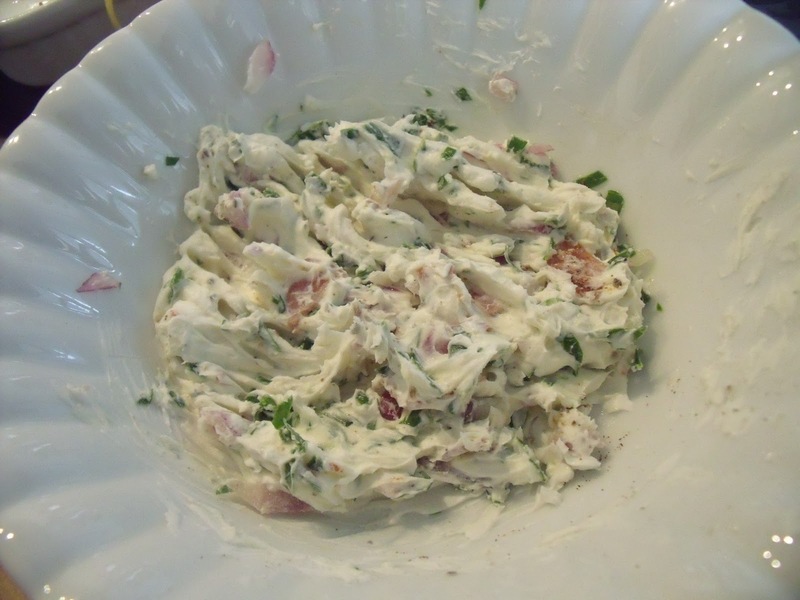 Mix well with a fork to make the filling. Season with freshly ground black pepper to taste. Fill the mushroom caps with the cream cheese mix. Put them on a cookie sheet and bake at 450° in a preheated oven for about 5 minutes. 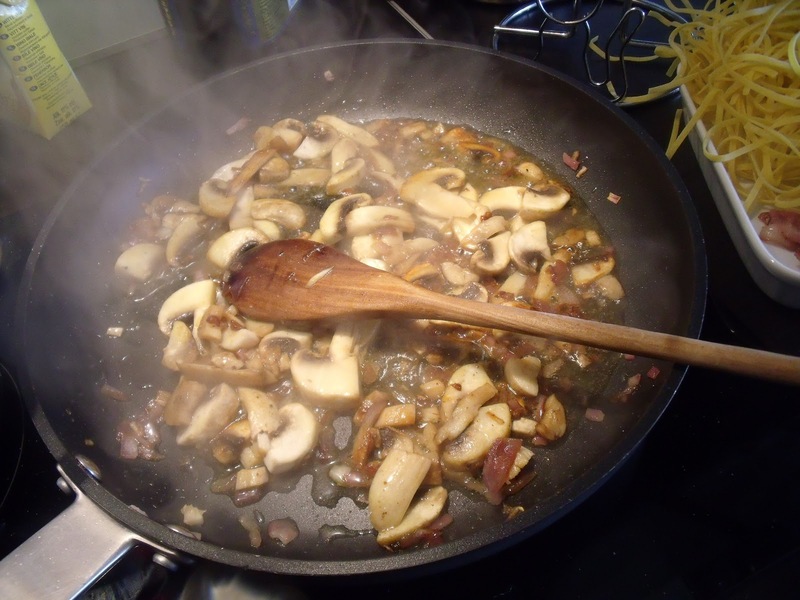 While, the mushrooms are baking, finish the sauce. By now the onions and mushrooms should be nicely browned. 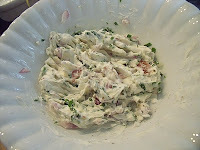 Add about 1/2 cup of white wine, the rest of the crumbled bacon and the chopped parsley. Taste and add salt if necessary. Season with freshly ground pepper. Idea! Mushrooms cooked like this are the perfect accompaniment to grilled breast of chicken! 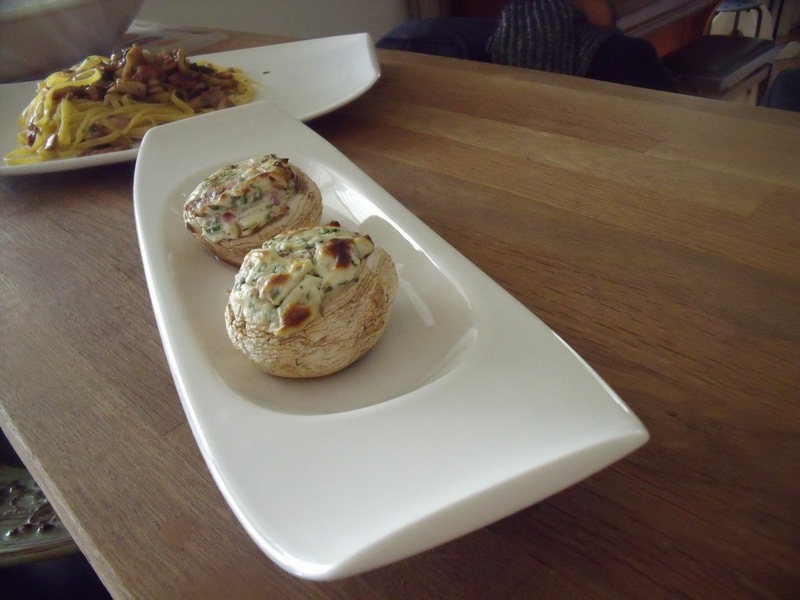 By now the stuffed mushrooms are nicely browned so take them out of the oven and serve. 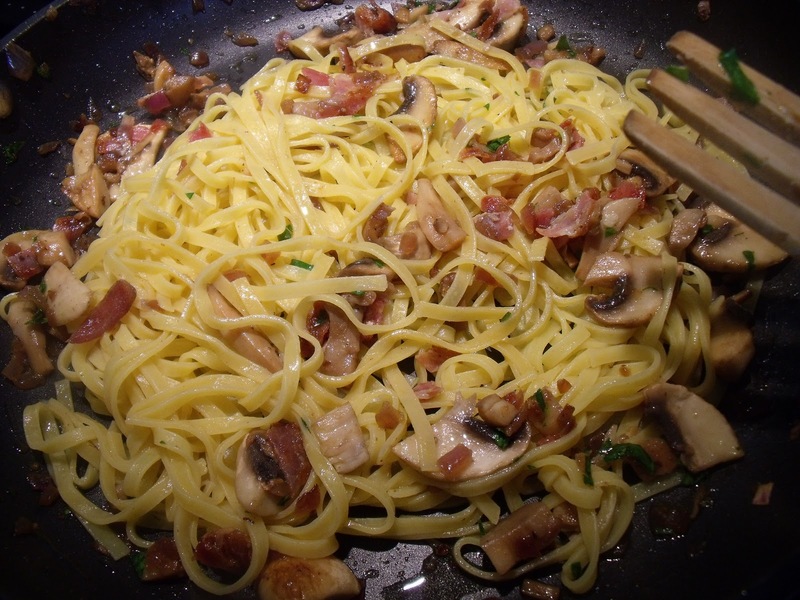 When you are ready to serve the pasta, put the tagliolini in to cook. Fresh pasta only takes about 2 minutes. When the tagliolini are cooked the way you like them, drain and add to the mushrooms and bacon sauce. Toss to coat the pasta with the sauce. Serve the past with freshly grated Parmesan cheese. This work is licensed under the Creative Commons Attribution-NonCommercial-NoDerivs 3.0 Unported License. To view a copy of this license, visit http://creativecommons.org/licenses/by-nc-nd/3.0/ or send a letter to Creative Commons, 444 Castro Street, Suite 900, Mountain View, California, 94041, USA. Donna has been living in Italy since 1988 and has done a lot of different things in these 30 or so years! She has taught English as an "esperta di madrelingua" (mother tongue expert) in a technical High school, helped her husband run an Italian Language School, managed a restaurant (head cook and bottle washer!) and opened the first internet café in the Marche. She loves to knit, cook and spin - in that order! But she hates housework! Most recently she has been organizing knit events and workshops in Italy to promote the work of Elizabeth Zimmermann. Feedback on Penne alla Vodka! Spaghetti with tomato sauce and "braciole"
"Menesta maretata"... which became "Italian Wedding Soup"
Bresaola, one of Italy's lesser know taste treats!! "Not Just for Sunday" Lasagna or... Cheater's lasagne! 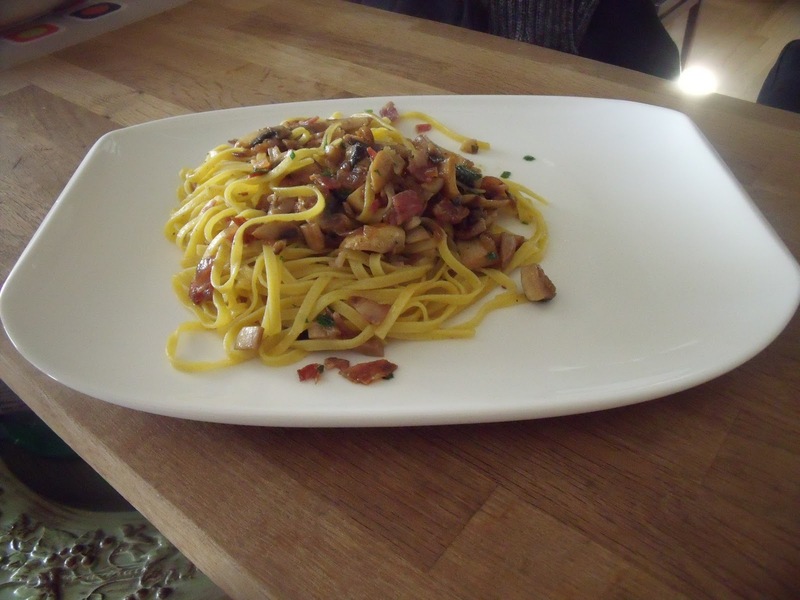 Coming soon: 'ndunderi, a pasta that UNESCO has declared one of the most ancient types of pasta! 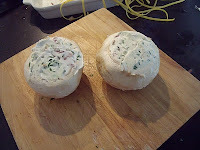 All text, recipes and photos are my personal property. Please do not use without my permission. Picture Window theme. Theme images by hatman12. Powered by Blogger.